This image conveys the feel of cold rain and the City so well...A beautiful image! 'PHOTOGRAPHER OF THE DAY' - November 1, 2009 - Congrats Al! Been a while since I have been on UF but can't believe I never commented on this image before!.... what a geat capture...love it! I just love it!! Has a long story to tell!! This goes back to the very beginning. It hasn't lost any of its appeal either. Really cool and creative image Al! Love the effect of the slow shutter speed and the wonderful NYC colors! Very well composed and thuoght out! Great view! One of my favorites and still a favorite. I have been away for a long time, how are you? I recently posted a book I published online. The whole book. Don't know if there is a place to post a book onn your site, but I would appreciate it if you could. Would give people an idea of how to do it. I self-published 600 copies, 300 soft cover and 300 hardcover/slipcased, signed and numbered. I have sold out and am therefor giving my book to the world. All of my native images from Usefilm are in the book, and all are in the Smithsonian. A perfect image and good cadre and good color.good luck. Interesting twist on a street scene. I especially like the composition -- the main subject about to leave the frame suggests a more historical spin in my interpretation. Almost like I turned and caught this scene out of the corner of my eye. Still nailed the rule of thirds on a panned shot. Well done. Al this is a great image. You've got all the accolades for this one, so I'll ask a technical question. Is it possible to use a Nikkor lens with canon SLR? Someone may have noticed it alredy, but I didn't read that comment. I'll check again. I have a small doubt for the donation. Can I make the donation using a debit card? I am fron India, and the debit card also supports Visa Electron. How good was the mess Luis? When I saw the thumbnail I thought to myself - how good can this mess be? is one of my prefer shot of you Al.. I have seen many time this shot idea of panning realization! the rain have in the people many magic momnet, but the difficult is the blocke d of the perfect momnet! i'm returned, nice.. see you later! Blurry images is one of those creative projects that could find many interesting captures there. this project indeed can changes the look of people that think photography just is the certain moments and focus and sharp captures about life. this shot that seems has captured from P.O.V of a driver in car is too creative. about the square composition i have some doubt, althought it is not a complete square but the lines that have continued by the long exposure time could be enhance the feeling in horizontal composition. the movement character has appeared like a dream and it is like that the story of the shot is continue with his/her motion. thanks Al for share this skifuly shot and congratulate for the award..
WOW... this is great. It makes me feel like I'm right there. Brilliant. This could be anywhere in the world but it has that busy New York winter feel to it. Sir, this is not the best you have in your work place,a motion image should have one of the 2 sides with more details,weather the forground or the back ground,also here where the person is your forground he is walking into the wrong area of the image,place this person on the left side and givem him enough room to walk through ,you gonna find this image much more interesting ,there is a great different between bluring an image this much killing all of its details and the matter of creating a motion effect .you do not have to like me at all but i do like you and thats where it should end.very best salam to you and yours ,the good man. I am a huge fan of blurry images. I love the motions the action. They just seem so alive to me. this shot here is amazing. it's an excellent blurred image and I love the silhouette person walking by. kinda like a ghostly image but not scary at all. great shot. Wow!!! U captured the fury of rain very well!! I guess u have taken teh shot from inside ur car!! good sense of move, congrats! excellent realization, motion was perfectly captured, blurring was indeed perfect! your ?NYC Freezing rain? is perfectly realized, unique, quite beautiful. Arresting pictures such as one should be uploaded larger ? the max allowed. 5225 Views, 22 Favorites, 122 Comments ... and still no award ... unbelievable! At the speed of life, as it should be. I am currently enrolled in a Master Degree in New Media. One of my assignments is to Create a genre analysis of a text from the cultural field within which I practice. For example, you might choose to analyse an artist's blog as an example of a new media genre or, if you are a writer, you might select a poem (either on paper or a e-poem) and analyse this in terms of its genre. Questions to consider might include: ? How would you name the genre of this example? ? What are the signs within the text which work towards meaning-making? ? What cultural literacies would a 'reader' of this text require? Make sure that the assessor can access the work you are analysing, either by providing a URL or a scanned or re-typed copy, depending on the type of work you have chosen. This may be provided in an appendix. I am contemplating analysig this site in terms of possibly defining it as a GENRE. I would love to hear from you and your colleagues about the site and what you feel its main purpose/intention is. mcphoto@bigpond.net.au so that I can discuss some issues with you. Please do not delete this Al because I have a feeling it is going to get a BIP award! wow! what can I say, great atmosphere, great photo! congrats. I remember perfectly this wonder of photo in panning! hour I also have seen the new plan, much beautiful one, I I believe that many photographers will make to see of the optimal photos! I try... I renew you mine compliments for this full photo of emotion that of usual a rain day they do not give. Excellent work and an effect very interesting! I've uploaded this image into the new project until there are more images, this is due to a bug in the front page for new projects (the thumbnail does not appear). It will be removed after we have a few entries into the project. i can almost feel the rain drops on me!!! Congratulations on such fine work, Altaf. Thanks for sharing with us at UseFilm! wonderful motion ..great frame :-) congrats .. Amit..
do check in my work and put in ur valuable comments ..
congratulations on your site for all the reasons all of us know (quality, smartness in design and all the rest). It is the best I have found and I am really glad every time I enter. I plan to become a donor the next days. You think "this is how I would shoot photos that I will never shoot, and this how he or she would do the same thing ". I wish I see more of your work dear friend. You gained my respect! keep the good work making us happy!! This is a magnificent photo and I cannot understand why it is rated with 4.8!!! I have noticed, not in here but in my country, that this kind of photos are considered a matter of chance and are not accepted!! What I believe is that it is a different kind of photography and I would really like to keep meeting people who like doing this, writing studies on this and help it go a step forward. I give you a 1000 dear!! I would like to listen to some opinions concerning this matter. Doing one thing (experimental photography)does not mean that something else is neglected (traditional models of shooting). Further to this after some point the outcome is not a matter of chance but the photographer knows how the color "breaks", is aware of the tones and the motion type. Looks more like London to me. :-) Very cool! this one is a magnific "paning" in aperfect day of rain!also the exposure is fantastic..! My favorite from your NYC portfolio. Love the movement and motion! Thanks for your comments, and your right the site is looking better and BETTER! Great mood pic. This is an impressionistic painting with light as your medium. I love it!! Ammiro tutti quelli che riescono a fare un mosso artistico. E questo lo è.Mi piace l'uniformità dei colori, l'unico colore diverso è quello sullo sfondo. La figura scura in primo piano è quella più importante ed è giusto che stia proprio lì. Da spazio al movimento e lo enfatizza ancor di più! Great shot! It's simply shot but very intesnive and good technique, congrats! very vanilla sky. surreal. love it. Why is it Altaf that you indulge others on your site but do not indulge yourself? I came here to dine at your table tonight only to find a few appetizers without an entre. I did not have enough to feed me and I am leaving hungry...hungry for more. I don't care if you are the originator and moderator of this site (and thank you dear Altaf for your MOST generous conbribution to SO many, by the way). But may I suggest humility is not welcome here...? Your site is a stage, a ballroom where we can all dance or create without self consciousness. We have critics and fans but who in hell cares? Art is subjective so throw it on the canvas and some of us will dance and some of us will sit it out! Please provide for ALL of us MORE of YOU...more of your art, your heart your talent. I love this shot...you found color and vibrancy on a dull rainy day... and you captured it...I found this capture more valuable than capturing a Bengal tiger. Warmest regards. great shot. was this a result of panning or slow shutter speed. excellent. the man with umbrella getting out of the frame is great ! Hey, I didn't know you posted anything, cool. Hi there. i'm a new photogrpaher here and its a good chance for me to see and learn. i have read all the comments about this picture and after i read all of it i felt i might miss something about photography!! Becuase i have few photos like this one was shot by my friend's children when they played with my old camera. I don't know, maybe our friends here said their coments regarding your other great work. anyway, for my taste. its not a photo, its something else which i might miss. (by the way, i dont see any rain or feel anything about anything , i just see a lady with umbrella u shot from the right seat of a car with confused exposure and little something on the photoshop) its opinion of a photography jonior :) your other work is great. good luck and happy new year to you. I aways come back to this picture. It is really great.Thanks for everything. You absolutely know that I love this picture! Everyone has already said all there is to be said - it's wonderful! So when do I get my copy??? Wow, what an image! Excellent presentation! Jose, I think this is a good picture, too. However some of us have noticed that you are posting the exact same phrase on hundreds of other pictures. I glanced down your comments list. Of the last 96 comments that you made, that exact phrase was used for 94. This is 'spam'. Please try to be more thoughtful and constructive. Excellent photo! I like it so much. Hihi... The site administrator, and photographer of the day plus EC! :-))) I like this shot, it has a really mysterious feeling over it and I find it very interesting! Somehow it gives me a feeling of "psycho's view", and how a disturbed person is sitting in a car, trying to find victims to kill or something. In our "calm" Sweden we have had many strange murderings and rapes etc lately, and they think that it's because psychos don't get help... and atmosphere feels a bit scary, even though I guess the risk is still small that something happens. But the mind is circulating around this quite a lot, and perhaps that's why I feel what I feel with this shot. It's very good, very strong, very original and interesting! It moves. 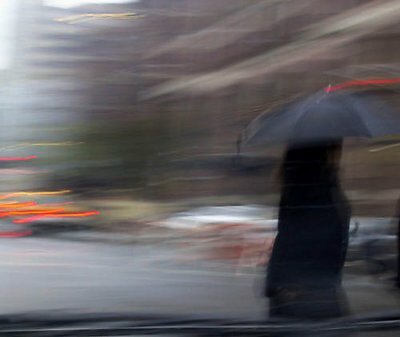 It moves like the rain, the wind, the cold, the energy of the city. It allows the eyes to do what it wants, and that is to pretend it's seeing movement and time progressing. I've seen pan shots like this and composition that's better, but honestly I give it 7/7 overall because my liking for it carries that well. !!! :))) creative capture... nice sense of movement!! Hugs,T. Congradulations on POTD award. Well deserved if not for the photos just for your sheer hard work on the site. You are realy wonderful for your promptness, deligence and openness. Usefilm.com gets bigger and bigger because of people like yourself. I want you know that you and your collegues are very much apprecited. Now for the image above - I am very very sorry I just can't get it. I looked at your portifolio. You have very few images there but excellent ones. They should have choosen the Newark bridge shot. Wow, I can almost feel the cold! This photo sings to me in it's own special way. From such a bustling city comes poetry in motion from that one percise moment of capture. "I see music as the augmentation of a split second in time." Considering the unpredictability of the technique (of panning while shooting), this could have been a mess. Fortunately you got a great result - it's the 'impression' of the wet gusty weather that is so effective here. goooooood. i like the rain!! I will leave technical comments aside - many have been made but I will speak to the emotive/artistic aspects of this photo (I prefer that stuff anyhow). This is how blustery weather feels so that makes it good imo - the technical aspecs (comp, tone, etc.) don't distract from the feel so that makes it excellent imo. negative space concept works with form of picture, great !!!! SIMPLY DELICIOUS... if that is an appropriate expression for a capture! Excellent picture Altaf, I feel the freezing rain in my face! i absolutely love this kind of long exposure in an image. very cool! You've really grabbed the (e)motion. Great work. Well, I am definitely late to the party here, but let me just add that I think this is a wonderfully effective image, rendered as you intended, and as it should be, in my eye. I say this after reading your reply to Neil, but it just reiterates my initial feeling upon viewing this, and that is: To me, the BEST part of the composition is the umbrella person moving off frame. It SO emotes this quick glimpse feeling of a passing moment in the NYC rain. The rest is wonderful gravy, with the blurred, wavy lines adding to the sense of hurried movement. Outstanding and evocative work, Al. 2. The red line stays because it reflects what is going on in the left side of the frame. 3. I don't like to photoshop my work especially when I think it works a lot better this way. I think the idea of capturing movement here was good; however, the movement would have been better panned than shaken. Also, the red line above the umbrella is a distracting element--you might consider removing that. Most importantly, I think it would have been much better if the person weren't already partly off camera. this really deserves an Editor's Choice. You can feel the rain and the cold trough this picture. Like a paint, beautiful motion shot. I was wondering, if this photo would have gotten this much attention if it was not taken by the owner of this site. I will have to try this, slow shutter speed and shake the camera :) Good job Altaf. One of the most beautiful images within your portfolio, for my taste. I just find a little distracting that bright part on the left top corner of the image. regards. Great motion shot! I love the colors in this. I would say a great piece of art work by a camera. Very nice shot. yhis is a verydynamic, exciting shot, and well balanced too-the streaks of light on the left balancing the red one on the umbella! It is absolutely brilliant!!! Decisive moment....inclement weather....fast action....and you had your camera in position to get it. Blur adds to the mood. Thats why they say...when the weather gets bad...the pictures get good. Reminds me in a way to steiglitz photos of snow on 5th Ave. A little stretch....but a nice capture. I think I am about to commit Hari Kari. I have seen this shot since the first day I logged on to Usefilm.com Quite frankly, I just don't get it. Man you have some great shots. I do not know what it is that an old midwestern fireman like myself does not see that everyone else does. But I am glad we each have a different taste, Damn how boring it would be if we all were perfect like me LOL! Al, seriously, I mean no offense, I just do not get this shot. Maybe thats why your the editor, and I put out fires for a living, ya think? A technique I always wanted to perfect but never could !But ,more then the technique your concept is great.Congrats on the EC. Thank you jay, welcome to usefilm. Very artistic work. An interesting result and twist on the common. Thank you I appreciate all the comments. this is a fantastic photo (as if you don't already know that)! i guess i just want to jump on the bandwagon and say wow! When I learned of the new 'top 100' pics, I thought of this image as my number one. However when I found it in the Editor's choice section, I couldn't add it to my top 100, or comment on it again. So, I looked back to when I commented on it before, and found it that way. It seems that the comments section has been deleted from that particular area of the site. Was this done intentionally? By the way, Al, some great ideas lately. Welcome to Usefilm! You think you like this picture now, you should see it printed! I bought this image from the Usefilm Fineart store and it's incredible and it supports the site. congradulations!, i love this shot. this is a great picture. my kind of work. I thought that this was one of my favourites on usefilm. The more I look at it though, the more I see further potential for improvement. I would have liked to have seen the main subject slightly less blurred. Who am I kidding? This is a great photo, full stop! Al, this is one of my favorite images on this site. I really don't know why.... Maybe because it uses a technique I have never tried, maybe because it evokes an impressionist feeling of reality. This image reminds me of what I see when I dream. Wah Janab!!!. Kya Tasveer hai... Tasveer ho gaya hoon Tasveer dekh ke! Aap se bahut kuch seekhna hai. Nanette, it grew on me ages ago - I ordered a print which arrived last week and it is really terrific. Getting it framed next week. Best wishes to all on Usefilm. thank you chris, don't change your mind let us see it. I like your work a lot and want to see your spin on it. Most excellent. Might crop the top left corner a bit and the bottom if you want the background to be totally abstract. Either way this rocks! Altaf, Yes! Yes! I see what you mean about not always wanting a crisp clear picture. Unfortunately the idea in the shot I took "Fishing at Sunset" wasn't suppose to be blurred. I've taken some pictures of hockey games where I purposely blurred the surroundings in order to indicate movement of a particular player but I'm not happy with any of the attempts. This shot is wonderful! I'll keep trying. This image really grows on me everytime I see it. It has a superb amount of dynamic motion and tension. Obviously this comes in large part from the motion blur but the composition and splashes of color really help the effect. Terrific. I love this image and YES it is a winner. I would like a copy for wallpaper. Brilliant picture with loads of atmosphere helped by the muted colour range. More please!